I have nothing crafty to show this week. 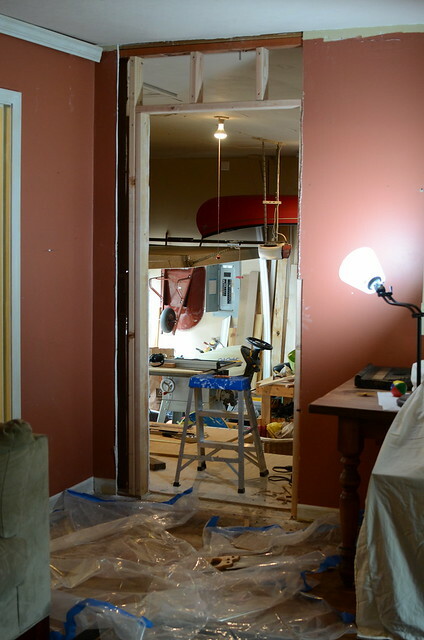 Between the kitchen remodel and reading the Hunger Games series, I have not even touched my sewing machine. Has any one else read the Hunger Games? I really didn't want to read it, but my husband talked me into it. Of course he was right. The books are really good. 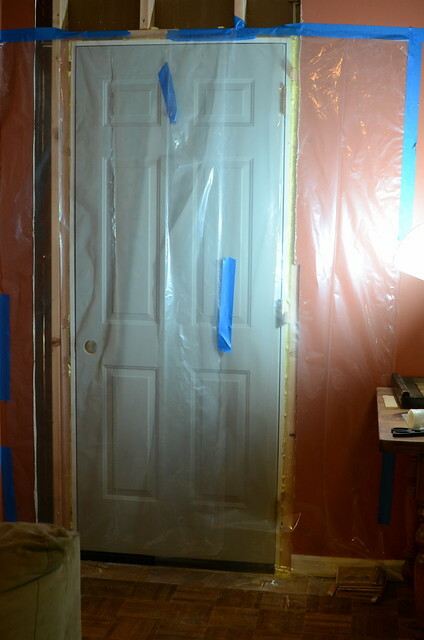 I do have some pictures to show of the kitchen remodel progress. 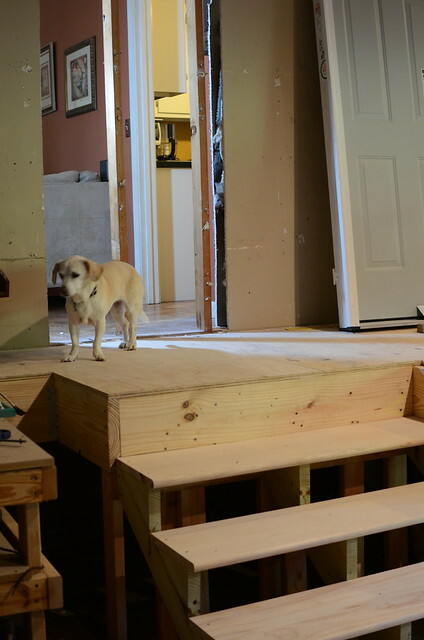 My husband was able to make new steps for the landing. Then he made the opening for the door. Bailey likes having multiple ways to exit the house. Here's the view from our family room. 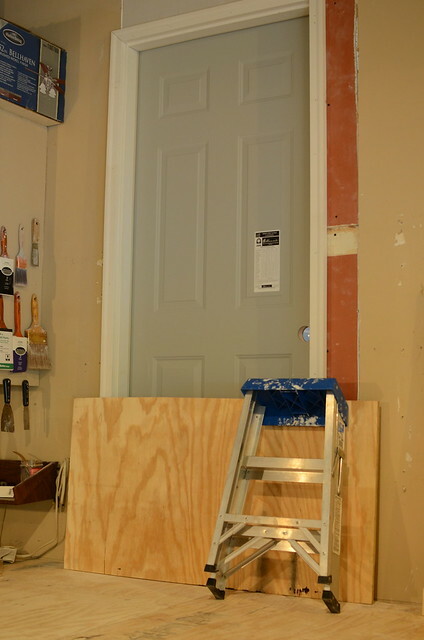 Then he was able to get the door in on Sunday. Here's what it looks like from the garage side. We also met with some designers on Friday afternoon. They actually thought that we should keep the parquet floors and refinish them. They said that they have seen them stained a dark espresso color that looked really good. Even though I had my mind set on real hardword or bamboo, I am all for reusing. So I am excited that this is an option. They are supposed to came back out for some measurements so that they can write up a plan for us, but I am not sure if it will actually happen. They did not seem overly anxious to work on such a small project, especially since Mitch is going to do a good part of the work. I guess we will just have to see what happens. We also have a friend that was an interior design major coming over this weekend to give us some advice. I am ready to have a definite plan in place so we can get to work. 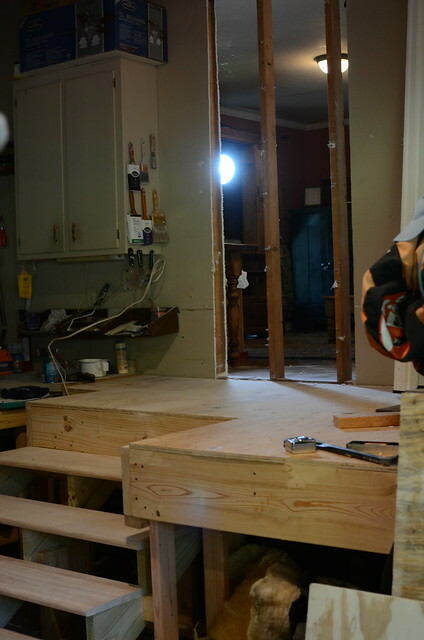 I am pretty sure I got no sewing done during our kitchen remodel, too. It takes a lot of energy and time to do that. Plus your house is a disaster. It's looking good! Glad you have some experts telling you what to do. I'm sure it will look fabulous in the end. I think staining the floor dark will look pretty cool, too. Might as well use it! You guys are doing a great job! I know you're proud of all of Mitch's hard work. There's something very rewarding about doing the work on your own. I've seen floors restained before and they've always been gorgeous!